Wherever you live and work in the Metro Atlanta area, there are five Fish Window Cleaning locations ready to serve you! Click here for a FREE on-site estimate! 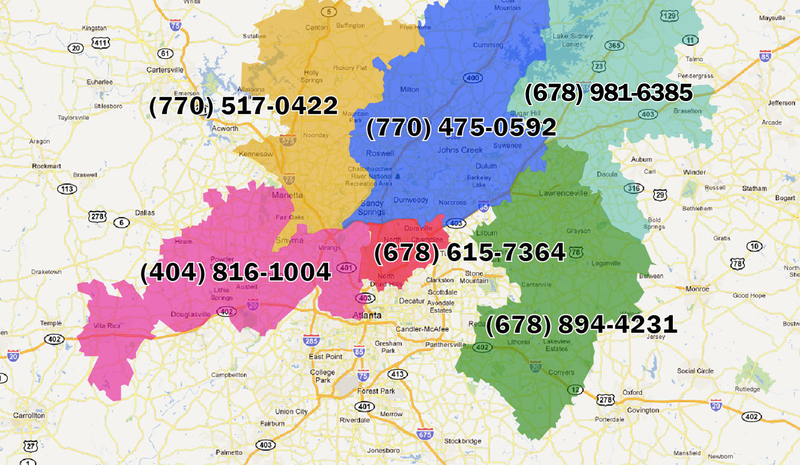 If your home or business is not within these highlighted territories, please call (678) 894-4231. We work hard to make sure your experience with us is hassle free. We offer free on-site estimates, convenient scheduling, and professional, efficient service. We clean more than windows; we provide a variety of services for you to check off your to-do list including ceiling fan cleaning, skylight cleaning, chandelier cleaning, and more. We also provide power washing services for the outside of your home and concerte/stonework surrounding your home. Be sure to mention these additional services when you call for your free estimate and we will include them separately. "Their team can be trusted to come into my home without my having to 'put things away'. Their friendliness brightens my day." Since we're a business too, we understand that different businesses need different service plans.We provide customizable scheduling to work with your specific needs and budget. Our professional cleaning team is uniformed and licensed, bonded, and insured. We work quickly and quietly so we don't disturb your employees or your customers. Let us save you from a headache by taking care of those hard to reach spots or 3rd story windows. which is attributed to their consistent reliability and great communication." We offer the convenience of multiple payment methods, including cash, check, and all major credit cards. If your zip code is not included in this list, please call (678) 894-4231.